I attended the World Show in Novi, Michigan the weekend of November 19 & 20, 2016. I took Rosie (aka Pelaqita She's No Second Hand Rose). 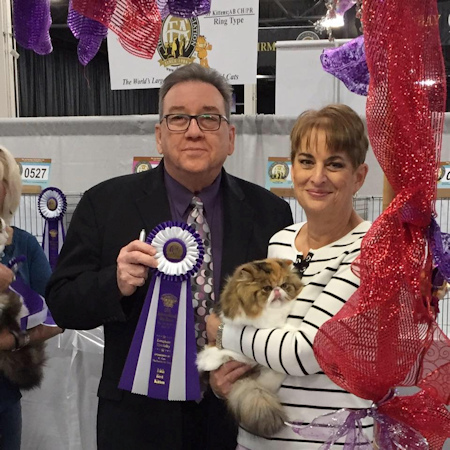 Rosie made one final on Sunday, November 20, 2016, under CFA Judge Darrell Newkirk and received 14th Best Kitten! My friend, Jackie Bates, took Eden (one of Funfetti's kittens from earlier this year). Jackie's cat, Eden, made three finals: 12th Best Cat in Champion, 2nd Best Champion, and 3rd Best Champion. I am so proud of Jackie; she truly is a welcome addition to the world of cat shows. She presents her cats in beautiful condition and groomed to perfection which is not an easy feat for a newbie. We were so surprised and happy with a win of this nature at such a large show with many, many outstanding cats. Jackie and I had a great time at the show. It was a long and exhausting weekend, but we had fun. It was great to see many of our cat show friends as well as making a few new friends. The show was truly a "world" show with exhibitors from Europe, Ukraine, China, and Japan. Wow! On Saturday, I received a call from my husband, John, letting me know that Sugar had started having her kittens. Of course, she waited until I was gone so she could worry her dad! John helped Sugar deliver four beautiful kittens: two torties, a brown tabby & white male, and a solid black male! On the way home from the show, I started getting reports of cats that had attended the show coming down sick. By the time I got home, it seems that as many as 15 different catteries were affected by this fast moving, airborne virus! Evidently, this virus came over from Europe, and since our cats have never been exposed to this virus, they have no immunity to it. Quarantining/isolation does not seem to be effective in keeping the virus from spreading throughout the home/cattery. Disinfecting methods seem to have little effect. The good news is once sick; the cat develops an immunity to the virus! Additionally, it seems that within 72 hours of a kitten/cat getting sick they are no longer contagious. Thankfully, none of my cats got sick. However, Emma's kittens all came down with it within about 24-48 hours of my being home and then Sugar's week old kittens got it. So, I was treating ten kittens for diarrhea and vomiting by giving them medication for vomiting (Reglan injectable), diarrhea (Imodium AD), and sub-Q fluids. I also supplemented their feeding with KMR (kitten milk replacer) mixed with non-flavored, Infant Pedialyte (instead of water). All of the kittens gradually started feeling better and were no longer losing weight. After about four - five days, the kittens all started to gain weight again and their appetite and energy levels returned! I know many of my fellow exhibitors have made mention that they will never go to another World Show as they do not want to risk their cat(s) becoming sick. While I respect their caution and I know some of them had many, many more sick cats than I, I will continue to show my cats as long as they are healthy. I find the risk of my cats getting sick minimal, and I likened it to when I sent my child off to kindergarten, and she brought home some germs and viruses that she and I had never before been exposed to and we spent many months getting sick until we built up an immunity. In my opinion, a strong immune system is a direct result of us (and our animals) being exposed to germs, bacteria, and viruses. So, I may look at this a bit different than some of my fellow exhibitors.